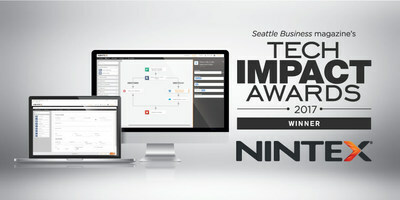 BELLEVUE, Wash., Sept. 27, 2017 /PRNewswire/ -- Nintex, the leader in workflow and content automation, is pleased to announce the company has been awarded a 2017 Tech Impact Award in the productivity category for its Nintex Workflow Platform from Seattle Business Magazine. Company representatives were recognized last night during the awards banquet in Seattle. The annual Tech Impact Awards recognize Washington State companies that make a positive impact on business, industry or society through technology. Today, thousands of enterprise organizations turn to the Nintex Workflow Platform to automate, analyze and optimize business processes with clicks not code, both in the cloud and on premise. The powerful platform has been strategically designed to be easy enough to be used by information workers while being trusted by IT departments around the world. "The entire Nintex team is dedicated to delivering workflow, document generation and modern forms capabilities that helps everyone work better," says Nintex CEO John Burton. "We're honored to receive local recognition from the Seattle Business Magazine for the growing impact our technology has on businesses here and around the globe. While we have over 7,000 enterprise customers in 90 countries across the world, it's particularly gratifying to be recognized in our headquarters home town." Earlier this year the Nintex Workflow Platform was named Best Workflow Tool of 2017 by Editors at Redmond Channel Partner, and this month Nintex Workflow Cloud® was awarded a 2017 Golden Bridge Award in the Best Product, Services, Innovation of the Year category. To start a free trial of the Nintex Workflow Platform, visit www.Nintex.com/get-started.